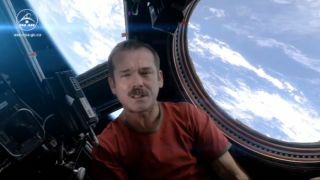 After five months aboard the International Space Station sharing his tips on keeping fit in zero gravity, taking amazing photos of Earth and giving us a reason to use Google Plus, Canadian astronaut Chris Hadfield is set to return to earth. But before he leaves the ISS, the social networking astronaut has one final intergalactic gift to share, in the form of a cover of David Bowie's classic, Space Oddity. The astronaut performs a slightly modified version of the song, playing guitar and singing as he floats through the ISS. His performance is near flawless, especially given the challenges of filming and performing in zero-gravity. The question now is why this song isn't available on iTunes yet? Although we probably will have to wait for him to return to Earth after handing over command of the ISS to Pavel Vinogradov this morning. This is ground control, to Major Tom. Can we get more Blips?